From its solid base and creative outreach, this second album by UK singing-song writing musician M.G. Boulter makes a sturdy case to embed itself in your DNA. WITH WOLVES THE LAMB WILL LIE is not just abstract in its title and requires a curious ear, but is coated in a magnetic appeal to lure those not put off by its lack of melodic anthems. 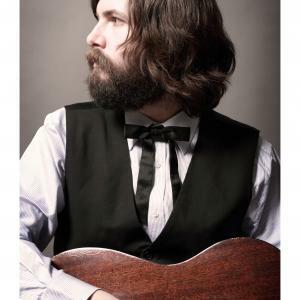 Boulter utilises the tools and help at his disposal well to construct a record conducive with the effect of what we have come to recognise from the UK’s folk/Americana/indie scene. Sincere writing, an experimental roots-driven sound and a creation designed for longevity, all define a record ready to reward the hard yards. Known for his lead role in roots rock band The Lucky Strikes, Boulter has also immersed himself in the folk community to the extent of working with acclaimed producer Andy Bell on this record. Two names from the list of album contributors jumped out immediately in Ben Nicholls, best known as the talented multi-purpose bassist with Seth Lakeman and the Full English, and Lucy Farrell, a key member of Emily Portman’s band of which Boulter has been a touring member. Together with the other players, they have helped towards the rolling out of a twelve track album mainly low key in its tempo bar a couple of midway tracks headed by ‘The Last Song’. Thematically, the album surfaces as a character study with four of the opening five tracks all introducing the narrator and their casual acquaintances. The pick of these could be the indecisive ‘Sean or Patrick’ which leads off, closely followed by the twist in ‘His Name is Jean’ and the brace of characters revealed in ‘Carmel Oakes’ and ‘Lalita’. However the anchor track of the album’s second half probably shades the lot with a hint of twang enhancing the enticing acoustic-led ‘Someday the Waves’. Boulter’s purposeful vocals match the mood of the record and help keep the production together especially when the listener’s attention is slightly strained in the album’s latter stages. However like that fine full bodied red wine that needs a little post-uncorked breathing time, this record does mature upon each listen and proceeds to grow a warm coat of moving tendencies. There is no denying that its tenure will cleanse your mind over time implanting its genuine qualities in a thoughtful and hypnotic way. The mellow status of the album gets proverbially lower in the final stages especially when strains of sombre cello kick in. The twin concluding pair of ‘Love Trees’ and ‘Let Night In’ usher in the record’s closure with a marvellous haunting finale, marrying some gorgeous harmonies and rewarding the listener for perhaps hanging in there in places. M.G. 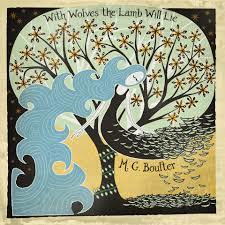 Boulter will certainly accrue sophisticated praise from hardened sources of introspective UK Americana for WITH WOLVES THE LAMB WILL LIE. For wider appeal the message is to give it a few spins, the utmost respect and attention, and the promise is unrelenting appeal will emerge. As we enter the New Year, this album epitomises the wise old saying: ‘for life not just Christmas’.